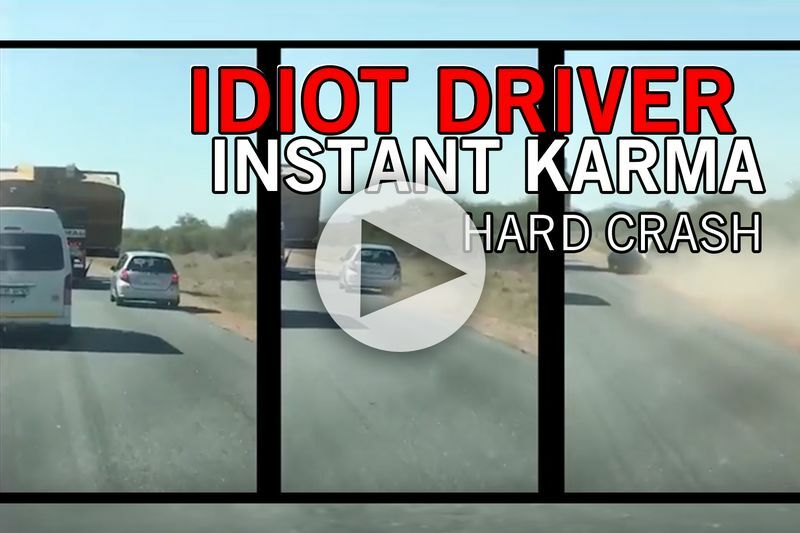 At around midday on Sunday, a driver pulled out his cell phone just in time to capture the consequences of one impatient idiot driver's conduct, when he attempted to overtake a large, slow-moving truck, needless to say instant karma was served. Suttie (the film taker), was travelling to Harare on the Beitbridge road, near the South African border with Zimbabwe, when he came across a silver Honda Fit driver trying to overtake an abnormal load truck in front of him. "I was driving about 40km from the Bubi River. I saw [the Honda driver] overtaking several vehicles on the road. I even stuck my hand out at him to try and get his attention and find out what he was doing," Suttie said. Suttie had been travelling to Zimbabwe for a broadcasting gig when he became caught in the action. "I knew something was going to happen because of the way this guy was driving," he said when he was asked why he decided to record the careless driver. After the accident, Suttie pulled over to check on both drivers involved. "I actually managed to give the video to the truck driver so that he may have some sort of evidence of what happened." Osborne Bunu, who had been driving the abnormal load truck at the time, said that his truck just had minor scratches, but that the Honda was a write-off. "There were four people in the car, a husband and wife in the front, and two people in the back," he said. Bunu had been travelling at about 50km per hour, escorted by two other vehicles in front. He had been transporting a 750 000-litre water bowser to Zambia, via the Harare road. "The husband had lost control when he tried to overtake me. In the video, you see the car crashing into the side of my truck but very quickly swerving off the road. It was his wife in the passenger seat that grabbed the wheel at that point and pulled the car away from my truck, causing them to crash on the side of the road," Bunu explained after he had spoken with the driver. He said small vehicles need to be very cautious when approaching heavy load trucks. "We have to drive in the middle of the roads with our load. My load was six metres wide. If I drive close to the side, then small vehicles behind me think I am making way for them to pass which is not the case. It is dangerous to overtake a heavy load truck and small vehicle drivers need to understand that."